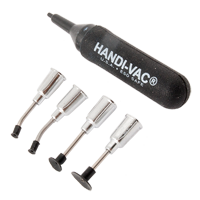 HANDI-VAC Vacuum Tweezer Kit With 5 Probes And Vacuum Cups applications for this tool include SMT parts, metal parts, plastic parts or any item having a smooth-nonporous-surface that the rubber vacuum tweezer tip can seal against. This tool can be used with any of our rubber vacuum cups ranging in size from 3/32” (2.38mm) to 3/4” (19.05mm) in diameter. Use the larger cups to pick up larger and heavier parts. Vacuum gripper BGA AOYUE 939 + ESD SAFE is used for precise operation when replacing BGA, SMD and others elements, is also heplfull for all other work related to the transfer of electronic components without use of tweezers. The vacuum is produced by pressing a button. This results in a suction silicone tip heat resistant to the transferred item. Includes 3 tips of different sizes. Grapple very good quality. 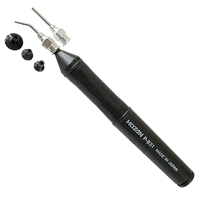 Vacuum gripper BGA HOZAN P-831 is used for precise operation when replacing BGA, SMD and others elements, is also heplfull for all other work related to the transfer of electronic components without use of tweezers. The vacuum is produced by pressing a button. This results in a suction silicone tip heat resistant to the transferred item. 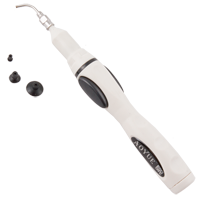 Includes 3 tips of different sizes and 2 nozzle. Grapple very good quality. 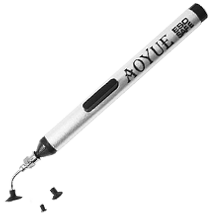 Vacuum Suction Pen BGA Aoyue 939 with this tool you can pickup and placement of delicate SMD components. It is a anti-static vacuum suction pen,won't scratch or damage sensitive parts. Light and easy to carry, can be inserted into pocket. Will be a good helper while you do BGA rework. 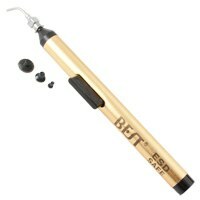 Vacuum Suction Pen BGA BEST-939 GOLD with this tool you can pickup and placement of delicate SMD components. 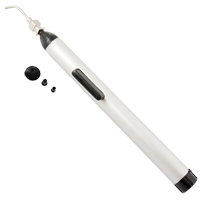 It is a anti-static vacuum suction pen,won't scratch or damage sensitive parts. Light and easy to carry, can be inserted into pocket. Will be a good helper while you do BGA rework. 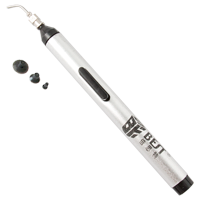 Vacuum Suction Pen BGA BEST-939 SILVER with this tool you can pickup and placement of delicate SMD components. It is a anti-static vacuum suction pen,won't scratch or damage sensitive parts. Light and easy to carry, can be inserted into pocket. Will be a good helper while you do BGA rework.